The ice is off the AuSable River, the Red-winged Blackbirds and Eastern Meadowlarks have returned and the weather has been so nice it's got us dusting off our hiking boots and covering some miles along our favorite trails. If you're eager to begin exploring your favorite section of forest, it's important to remember to wear sturdy boots and layer with wicking underwear and some warm fleece to keep the Spring weather at bay. And don't forget a warm hat! Cold notwithstanding, this is still a great time to get outside. Luckily, this time of year brings a fresh batch of new gear to help entice us to leave the woodstove and enjoy the outdoors. To help ease back into your old hiking boots take a look at a pair of Superfeet footbeds. A pair of Superfeet will replace the footbeds in the boots or shoes you already own and make them feel brand new. Superfeet footbeds have 30+ patents associated with them, all designed to support your feet and make your walking more enjoyable. These footbeds have a molded plastic piece on the bottom to hold your heel in place. They will help to realign your knees and hips to alleviate some aches and pains. Come by our store and examine a pair, we'll give a complete rundown. Another indispensable part of an enjoyable hike is a good pair of socks. In the last few years socks have undergone too many changes and improvements to list. Merino wool is widely used in socks because it is a great temperature regulator and good moisture wicking material, plus it keeps your feet warm even when it gets wet! The construction of wool socks has progressed far beyond where we were even just a few years ago. Features such as venting channels keep your feet cooler during periods of high exertion. Modern machines are now capable of knitting a thicker and denser bottom to provide more cushion to the sock. Smartwool and Bridgedale socks feature these new technologies and many more. These socks are made for hiking or running and will do everything but wash themselves to make your feet more comfy when you're out on the trail. Now that we have your feet covered, let's talk support for your knees, hips and lower back. If you haven't tried the new shock-absorbing trekking poles, stop by our store and take a look at a pair. Be careful though, you'll love 'em. 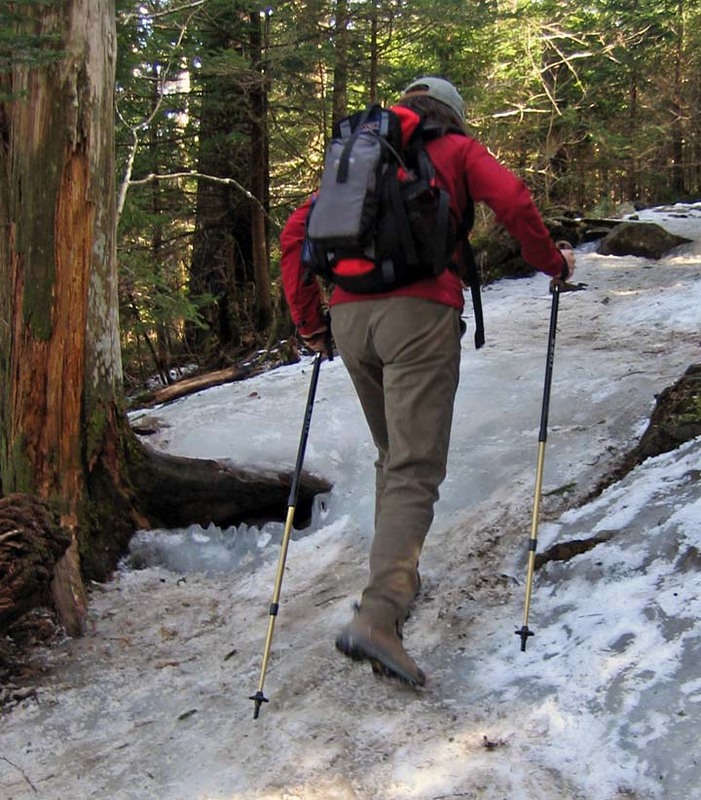 Trekking poles aid in the distribution of your body weight by not only giving you an extra "pair of legs" but by using sturdy and resilient materials to help absorb shock and increase balance. Some models even come with additional shock absorption by adding an "Anti-Shock System." All of these features let you hike longer and stronger with less fatigue and body wear. Nordic Sports carries Leki trekking poles, the winner of Backpacker Magazine's Editors' Choice award for its Makalu series. This series of trekking poles all have an anti-shock system built in to reduce impact forces. They also sport a comfortable cork or rubber angled grip. By using them like ski poles, trekking poles ease the stress on your knees and hips by distributing the load on your joints. Plus, they're great for stream crossings. These poles are also among the strongest in the industry while weighing only 19.8 to 21.7 ounces per pair! Many of us carry that same old daypack we've had for the last 10 years on every hike. We all love that old pack, but it's time to take a look at a new Camelbak hydration pack. These packs have a taste free, anti-microbial reservoir in them with a drinking tube connected to a leak-proof bite valve. You can actually leave for a day in the woods and come back MORE hydrated then when you left. Camelbak offers many packs for biking and hiking, but most importantly, they offer packs made for women and women only! The Daystar model features women's specific fit and a 70-ounce reservoir to supply you all day with plenty of water and room for a jacket and lunch. If you want a hot lunch, bring along a Jetboil stove. This is a great addition to any pack. The stove and cooking pot is a single, detachable unit with an insulated cover and a heat exchanger. This stove is so efficient, you can actually hold it while cooking and it boils a pot full of water in about 3 minutes (about half the time it takes a conventional backpacking stove). Make your afternoon tea and enjoy a hot lunch…everything tastes better on the trail. If you want to know where you are on the trail, the Suunto Observer will do the trick. It's a compass, a barometer, an altimeter, a watch, alarm and stopwatch all in one. And the package is not much bigger than your old Timex! This watch will help predict the day's weather by showing barometer trends and it will lead you back to the car with the digital compass. Perhaps one of the biggest innovations in the hiking world over the last several years is the GPS unit. Have you ever been unable to find your favorite trailhead or fishing spot? What about realizing that you've lost the trail and forgot to leave bread crumbs? Or how about just wanting to know your position on the planet? Well, GPS (Global Positioning System) units are designed to help you answer these questions. This handheld technology uses a network of satellites that continuously transmit coded information, which makes it possible to precisely identify locations on earth by measuring distance from the satellites. To help you find your place or mark a location, GPS allows you to plot and record places on your handheld map called "waypoints" i.e. your breadcrumbs. GPS can be used anywhere the unit can receive a satellite signal. This excludes places such as inside buildings, caves, and under water. There are multiple GPS handheld units for you to choose from. Depending on your desired application different models offer a variety of abilities and user functions. For mapping in your desired areas there is a plentiful and diverse CD-ROM offering. Without going into too much technical detail, these units can simply tell your location on a map or the most advanced tech units, which allow you to create your own maps! As the technology evolves so will the ways in which GPS enables us. Some very important considerations need to be made when using a GPS handheld unit. First and foremost, it is a good idea to have some basic navigation skills to rely on when out in the wilderness. GPS is a complement to navigation and should not be the only tool you rely on. Having a paper map and compass is a highly recommended way to ensure you're backed up by a non-electronic device that doesn't require batteries that can wear out or signals that fade. GPS units are a great way to enhance your experiences in the outdoors as well as a great tool for everyday navigation. These are just a few of the exciting innovations coming from the outdoor industry these days. We have a great time going out and finding these instruments for our store and even more fun using them ourselves in our adventures in Northern Michigan and Ontario. Pick up a couple of these fantastic new products, they'll make your time outside more fun. But remember, most importantly ------ get outside, play hard, and enjoy the fresh Spring season !